Since Sean and I are thinking about opening a pet supply store, we’ve subscribed to all the trade publications we can find. One of them, Pet Age, seems to carry advertising that leans pretty heavily towards pet stores that also sell puppies. There are frequently ads in Pet Age from the big mid western puppy sellers like Hunte Corporation., and Hunte Corp. has booths at all the trade shows this magazine and its parent company, Backer, promotes. Imagine my surprise when I opened the June issue of Pet Age and found a FULL page ad from the American Kennel Club – an ad touting the fact that “nine out of ten puppy buyers prefer their puppies to have AKC papers”. The gist of the ad is that store owners should skip the ConCK and APRI registered puppies, and sell only ‘authentic’ AKC registered puppies in their pet stores. That AKC puppies somehow carry more consumer appeal, due to their conception as being a ‘superior’ product. An appeal, I should add, that’s based on the public’s perception of the AKC as being the arbiter of good breeding practices. At a time when everyone is decrying the allegiance between AKC and Hunte, and AKC and Petland, and when people are insisting that AKC take a firmer stand against the sales of puppies in pet stores, what does AKC do? They spend registration dollars touting AKC registered puppies as great money making products to sell in pet stores. They get in bed with the very groups that they should be opposing, and they tarnish the very reputation that they claim their paperwork conveys. What’s truly ironic is that the ad touts the fact that the AKC is “Not for Profit”. I suppose that’s true, if you put aside how much money they pour into salaries, real estate and perks. I understand the theory that NGOs have to pay decent salaries to attract decently skilled people, but after a certain point it becomes a vicious cycle – you have to make more so that you can pay more to get people who can make more… (repeat endlessly). It’s similar to the statistics about the HSUS — they are, in effect, nothing more now than a vicious cycle of fund raising to make money to pay for more fund raising, with the barest minimum actually going to anything concrete. The AKC, of course, excuses their behavior by claiming that all of these registrations are needed – are necessary! – for them to be able to continue to run dog shows. On their own website, they state that they’d have to raise fees to a ‘staggering’ $20 per entry to be able to make up for declining registrations. Is this true? Possibly. I believe, as do many others, that they could trim this number down through selling their prime New York City real estate and a few other belt tightening measures. And if that isn’t enough? Then raise entry fees. Ask your average exhibitor which they would prefer – higher entry fees, and an AKC that refuses to allow puppies sold through pet stores to be AKC registered, or the current artificially subsidized entry fees. I’m pretty sure I know how that vote would turn out. Every single time AKC does something like this, it makes it harder and harder for me to believe their line about being the ‘purebred’s champion’, and to believe their PR about how they’re all about sportsmanship and breed preservation. Clearly, the only thing that matters any more to the AKC is making more and more bucks off of registrations, no matter where those registered puppies end up being sold. With this as their mantra, someone tell me – what REALLY is the difference any more between AKC and America’s Pet Registry or any other registry for that matter? When you start touting your services to the very people your organization is supposed to oppose, haven’t you lost the entire “We’re better than those other guys” moral high ground? The AKC just released their annual registration figures for 2007. The list contains all of the usual popular breeds, with one exception – for the first time since 1935, the Bulldog has entered the top ten most popular breeds list. Bulldogs are most popular in Los Angeles, where they are second only to Labs. 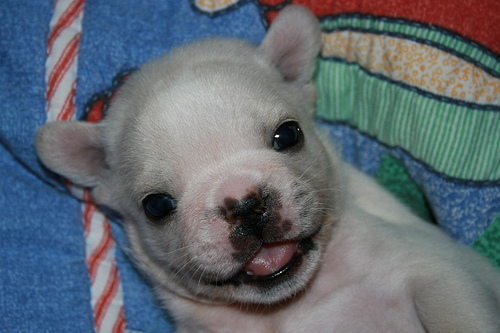 French Bulldogs have exploded in popularity, more so this year than any other. 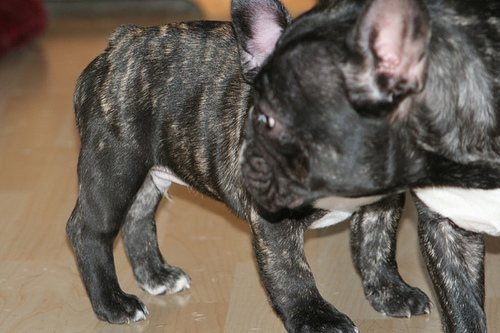 Many of us remember when Frenchies were so little known as to be almost a rare breed – this year, San Francisco and Los Angeles include the French Bulldog in their Top 10 lists. The increase in popularity of Frenchies is staggering in such a short period of time – they’ve increased +404%, second only to Cavalier King Charles Spaniels, at +406%. This means we can look forward to more puppy mills pumping Frenchies into pet stores, more backyard breeders tossing untested dogs together to make quick buck puppies, and more cheap imports flooding the market and swamping rescue. 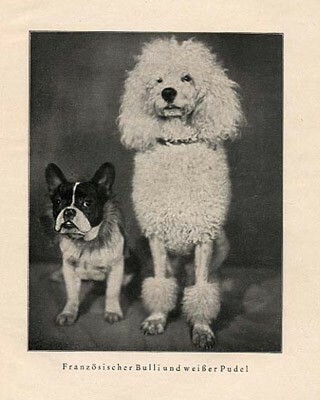 We can only hope that this surge in popularity is the crescendo, and that Frenchies can now slip quietly back into obscurity, becoming once again the dog most people assume is a Boston, a deformed eared pug, or a Pot Bellied pig on a leash. I’ve been going through my semi-semi annual bout of frantic filing, desk re-organizing, correspondence answering and cord sorting out (where the heck do all of those electrical cords and chargers come from that end up buried in my desk drawers? Are they multiplying on their own?). This has all put me rather behind on my email answering, especially since everyone and their brother seems to have decided to contact me about Mae. If you’ve emailed me, be patient – I should get caught up by Friday. Some new photos of my dapper little brindle man, Dexter. I tried to take some proper body shots, but he’s still at the ‘stop, you’re freaking me out’ stage of table stacking, and shots taken of him on the table show a cowering wreck who looks nothing like the pup I see standing on the floor, at ease. There are a few body shots in here, but in the best one Penelope decided to turn her head and block out Dexter’s. So, if you can ignore the fact that he’s headless, you get a pretty good look at his body. Solo is rapidly developing into the world’s cutest puppy. Don’t believe me? Check out this photo. Super cute, yes? Almost…. eerily cute? Yup, it’s true – he has super powers. Eerie, evil, super cute puppy powers. Be afraid.